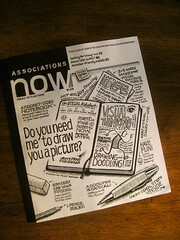 The August issue of Associations Now Magazine is out and I've had many requests for copies of the magazine after writing up my illustration process a week ago. Lisa Junker, the Editor-in-Chief of Associations Now Magazine has been taking requests for printed copies of the magazine. In fact, the requests were so popular they've run out of spare copies to give away! As a solution, Lisa and her team have created a PDF of the entire Visual Thinking feature article, with my cover and feature spread illustration work included. If you enjoy the article, please leave a comment here to let the Associations Now team how much you appreciate their hard work.